Aim. Mykolas Romeris university scientific journal Health Policy and Management aims to encourage a scientific dialogue between the European and global researchers; analyze the problems of health policy and management, reflecting national and international context and environment; disseminate innovative research experience; develop the research of interdisciplinary social and biomedical sciences and humanities. Format of publication. Periodical journal Health Policy and Management publishes articles in various fields such as social sciences (policy, management, law, economics, public administration, sociology, psychology, educology, social information etc. ), biomedicine (public health, nursing, medicine etc.) and humanities (philology, history, philosophy etc.) 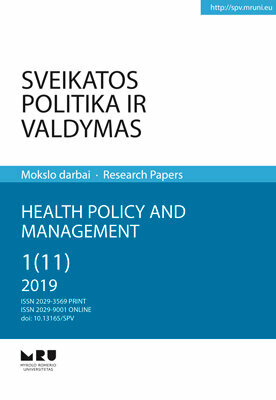 together with the scientific articles in other fields of interdisciplinary research that analyze theoretical and practical problems of health policy and management, presents monographs and other reviews of scientific publications, announcements about conferences and seminars of health policy and management. Periodicity. Journal is issued two times per year, in the English or Lithuanian language. According to the resolution of Editorial Board, articles can be published in other languages as well. Indexation. The academic journal Health Policy and Management is included in the EBSCO Publishing, Inc., PROQUEST international databases.